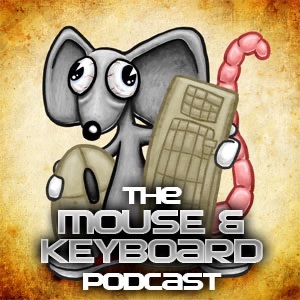 I listen to nlcast and when I heard about mouse and keyboard podcast I decided to check it out and after episode 1 & 2 I fell in love keep up the amazing show Trevor !!! Just the right length. Host knows topic well. I love that he pulls up older games that are still fun to play. Excellent show. MK Podcast is a very good podcast that looks to have great potential. There are not very many podcasts out there that actually cover the whole platform of PC gaming, but usually stick to a certain studio like Bungie, or Lionhead. I can't wait to see where this show goes, and plan to be there every step of the way. Amazing podcast! Concise. Perfect length. I love listening to it and I'm not even a gamer. Hope to hear lots more. as a budding nlcast listener i decided to give trevors solocast a listen, and while i don't do a terrible amount of pc gaming (i guess cuz i have a mac,go figure:P ) and i find 2001ish games being called "retro" a tad off, it's not a bad listen. it's not longer than it needs to be, like some podcasts are, the only thing it seems to be missing is a bit of banter between 2 (or more) people. other than that for a podcast only 3 in not to shabby.